In May of 1986, legendary hiphop group Run DMC paid tribute to their signature personal style with a single called “My adidas” off the album Raising Hell. The Rick Rubin and Russell Simmons produced record officially cemented what we now know as adidas Originals as staple footwear of the culture. Twenty-five years later, the brand salutes the Kings of Rock with a special edition release of the iconic Superstar 80s. 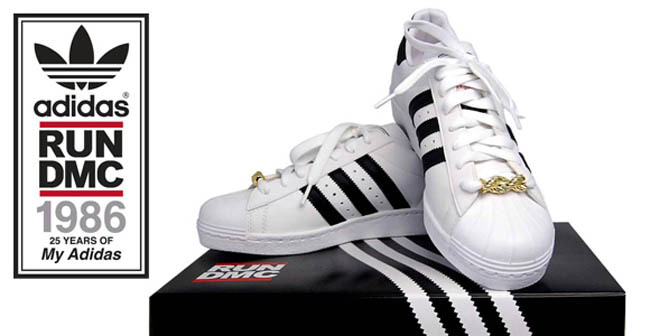 The “My adidas” 25th Anniversary Superstar 80s come in Run DMC’s signature white and black colorway with custom golden lace jewels and tongue branding. Also included is a special Run DMC x adidas shoebox. Look for these to hit select adidas Originals retailers on November 11th.